Spring beauty off the beaten path. There's no better time to visit Washington D.C. than the spring. Cherry blossom season is unlike anything anywhere else. The National Mall comes alive with fragrant, pale pink blooms. Of course, you can enjoy the world-class collection of monuments, memorials, and museums in the heart of D.C. any time of year. If you're feeling extra adventurous, delve into the under-appreciated gems on the National Mall while you take in the cherry blossom scenery. It all adds up to an extra-special experience exploring our nation's capital! The hustle and bustle of the Capitol can be a lot to plan for when considering overnight accommodations and transportation. Kampgrounds of America makes it all oh-so-easy for anyone wanting to visit, with campsites located in Millersville, Maryland. At the Washington DC / Capitol KOA Holiday, travel is made simple by a daily shuttle right to the US Capitol! You can feel at ease staying on 50 acres in a relaxing, countryside environment, while still getting to visit the city whenever you please. A variety of cabins are available for those not wanting to traditionally camp, and a hiking trail and campground events provide visitors with some fun without even leaving the property! Once you hop off the KOA shuttle at the National Mall, you'll find no shortage of things to see and do. 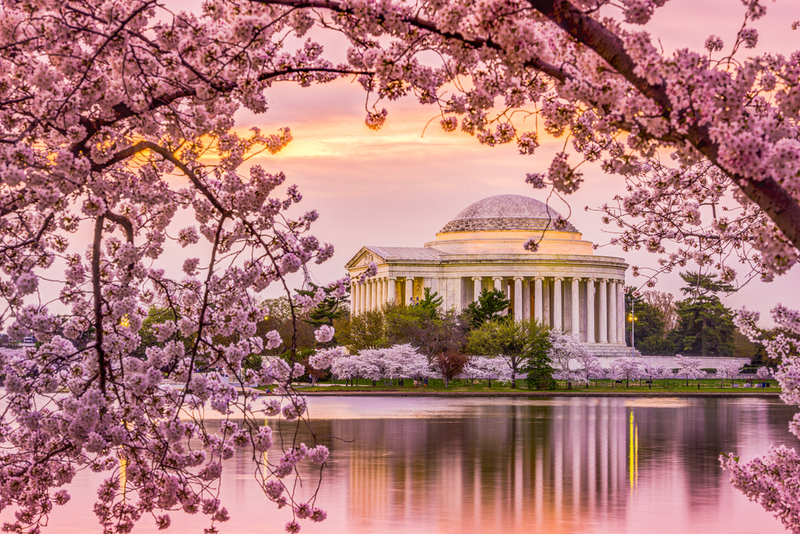 While you can experience D.C. and all that it offers any time of year, arriving in March or April allows you to be wowed by the striking cherry trees blossoming. Tidal Basin Paddle Boats offers boats for up to four people, including a swan boat, and you'll get to paddle among the famous monuments and cherry trees that are treasured by Americans everywhere. This is something you truly must experience at least once in a lifetime, and you'll get to see landmarks around the Capitol Building from a whole new perspective, even if you've previously visited D.C.! And if you want to conserve energy for a walk along the Mall later, you can opt for an electric boat. Remember to look into reservations before arriving due to the busy season. Seeing the colorful cherry trees reflected in the water is one of the most beautiful ways to experience this time of year in D.C.
With a great view of the Tidal Basin, even those not interested in political history will want to visit the Franklin Delano Roosevelt Memorial, especially when the cherry trees are in bloom, since the majority are planted around this area. Separated into four parts, each representing the four terms Roosevelt served as president, the FDR Memorial acts as a landmark to honor the man who led the country during a tumultuous time, when America faced The Great Depression and war. The memorial itself spans over seven acres, and includes statues of Roosevelt, his wife Eleanor, and their adorable dog, Fala. Eleanor's involvement in the United Nations is also honored here (in fact, this is the only memorial that features a first lady). This landmark tells years and years of stories from the history of the US, as well as honoring a man who served his country while battling polio. One statue at the site even depicts FDR in his wheelchair, giving insight to part of his life that Americans did not see too often. An influential part of American history is covered in this large memorial, and it's something people of all ages continue to learn from year after year. The Martin Luther King, Jr. Memorial is right near the Lincoln Memorial (where Martin Luther King, Jr. gave his famous "I Have a Dream" speech) and it's open to the public 24/7. A piece of granite called the Stone of Hope features a carving of the leader, who is shown looking out into the Tidal Basin. Quotes engraved in stone are next to the statue, and visiting the site at night provides visitors with a unique and powerful view of the statue and the words MLK spoke, illuminated by light. Being one of the only non-presidential monuments, the Martin Luther King, Jr. Memorial is a great addition to the list of landmarks to see in D.C., and depicts an incredibly important part of American history that is rightfully placed among America's most influential leaders. The MLK Jr. Memorial is also an ideal place for seeing cherry blossoms in bloom. You can get some of the best photographs of the trees while facing the Jefferson Memorial from this location. Though not as well known as the larger presidential monuments, the Albert Einstein Memorial is well worth a visit. The statue was completed for his 100th birthday in 1979, and has been a lesser-known little treasure in the city ever since. Located at the National Academy of Sciences, across from the Constitution Gardens, this D.C. gem pays tribute to three of the famous scientist's contributions. A paper in his hand shows equations for the photoelectric effect, the theory of general relativity, and the equivalence of energy and matter. By his statue, you'll be able to read about Einstein and his significance, and perhaps even take some pictures with this 12-foot-tall, larger-than-life tribute. A trip to the museum also makes for a break from political history and an opportunity to dig into some science! Obtain (free) tickets for this popular destination well in advance, because they run out quickly! The brand-new National Museum of African American History and Culture is well worth the competition for admission. It’s packed full of interesting artifacts and information you won't find anywhere else, covering African American history from its beginning to today. Plus, the museum takes a fascinating look at African American culture and its influence. Give yourself plenty of time, because you'll want to be there for a few hours to get through the multiple levels. Millions of visitors have experienced and loved the museum and the wealth of knowledge it possesses. A large cafe inside treats customers with traditional African American foods from four regions in the US: the Northern States, the West Range, the Agricultural South, and the Creole Coast. While not quite in the National Mall, The National Archives is at the top of most visitors’ bucket lists, and for good reason. The Declaration of Independence, The Constitution, and the Bill of Rights (The Charters of Freedom) all call this building home, as well as the Louisiana Purchase Treaty and the Emancipation Proclamation. Open daily until 5:30 PM, the National Archives Museum is free, and offers special exhibitions and events that provide insight into the documents that the United States has been built upon. The staff is incredibly knowledgeable, and seeing so many influential papers and treaties first-hand is a powerful experience that US citizens of should take advantage of. A trip to The National Archives is sure to be a memorable part of your D.C. adventure. Current art of all media is featured in this unique museum and garden, and will definitely whisk you away from the crowded tourist attractions at the National Mall. It all started with a man by the name of Joseph H. Hirshhorn, who came to America from Latvia as a child, and began collecting a wide variety of art from a young age. He later donated his extensive collection to the government. At the museum’s 1974 inauguration, Hirshhorn spoke of his collection as a "small repayment for what this nation has done for me and others like me who arrived here as immigrants.” Additions to the museum are constantly being made, and include works across all platforms of art, with a focus on contemporary and modern pieces that are thought provoking in countless ways. Just like the other Smithsonian Institutes, Hirshhorn Museum and Sculpture Garden is free, and is a great place to see modern art and films, as well as sculptures. Being that it is a living, ever-changing museum, the United States Botanic Garden is a place that you can visit again and again, discovering something new each time. The Garden was created by Congress in 1820, and has been serving the country conserving plant species and educating the public about them ever since. In the National Garden area, the First Ladies Water Garden and the amphitheater are just a few of the many features you'll want to check out. Across Independence Avenue, Bartholdi Park is a lesser-known part of the garden that showcases two acres of plant combinations and designs. You'll want to spend an entire afternoon seeing all the different displays! Special events, exhibits, and programs are always occurring, and since this is not as tourist-heavy an attraction, it's easy to pay a visit. The Peace Monument was created in 1877, and displays a unique honoring of fallen Navy soldiers at sea during the Civil War. The statue has two females at the very top: Grief is covering her face against the shoulder of History. Below them, Victory holds both a laurel wreath and an oak branch. Further below are Mars, god of war, and Neptune, god of the sea. Peace (or Pax), the Roman goddess of peace, stands facing the Capitol building, extending an olive branch. The monument is over 40 feet tall, and is well worth a closer look than you'll see in pictures. Standing in front of the Capitol, the monument makes for a great photograph, and is a powerful metaphor of philosophy and history. The world's largest library is well worth a slot in the long list of incredible places to visit in Washington. At the Library of Congress, you can take advantage of a free walking tour that guides you through history, architecture, and much more. Both the handwritten Mainz Bible and a printed Gutenberg Bible are featured as major parts of world history as well as American history. Thomas Jefferson's over-6,000-book library also calls the Library of Congress home, and it is intriguing to learn that he donated his collection after the War of 1812, when the first Library of Congress was burned by the British. An underground walkway will take you right to the U.S. Capitol. As you view the blossoms, consider their history. They came from the mayor of Tokyo, who gifted 3,000 cherry trees to Washington, D.C., as a manifestation of peace and fellowship in 1912. To those in Washington, and in turn, the rest of the country, the blooming of the trees each March represents the beginning of spring. A visit to the nation's capitol during this time of year is definitely on bucket lists around the globe, and the hidden and not-so-hidden gems found around the city make for a history-rich trip that's also beautiful and inspiring.